There's only one place open in the Dread-Yacht at the moment, Persephone's Cabin to the left near Cali. 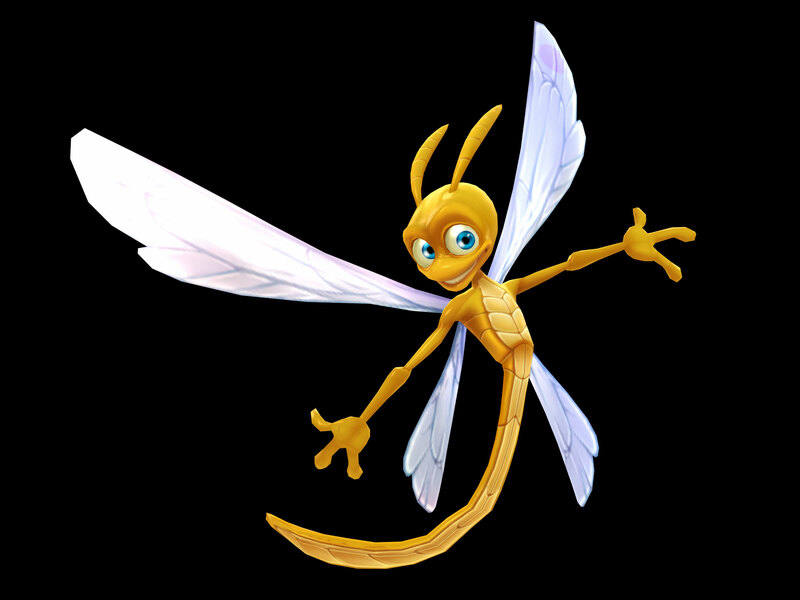 If you've got enough money you can now start upgrading your Skylanders, and even though the game hasn't yet told you what the Winged Sapphires are for you can still get the 2% discount for the one you found in Chapter 1. Leave the boat and step onto the land, over in the distance you'll see a Root Runner and some Bone Chompies, on the right is a bomb to pick up. Throw it at the wall with the purple bomb icon at the bottom of it, or if you're using a Giant you could also just simply attack the wall yourself as bombable walls can be destroyed by Giants. On the other side are a pair of Root Runners spewing out Bone Chompies, kill them and destroy the next wall with a bomb/giant. At that point you'll probably smash the little brick wall to the left, go through that gap and jump off the side down to a cave. If you don't have a Giant then you'll need a fast character to take a bomb with you from above. Inside you'll find a wall to blow up and behind that is a Treasure Chest. Bounce back up and smash down the last wall on the left. Eon will introduce you to the concept of elemental bonuses, if your element matches the area's then you get an increase in damage in line with your Elemental Power stat. The first one is Undead. There's no requirement to switch or anything like that, you can use whatever you like, it is just the game encouraging you to use a wide variety of Skylanders. To the right is a stack of blocks, push them all off the edge and then, standing on the near one, push the third forwards. Cross over it and go up the slope to the bomb. Of course as a Giant you could have just smashed through the wall but there's some coins up here too. Blow up the two walls to the left and to the north, then drop down and go through the gap. Time to meet the Drow Lance Master. Very similar to the Arkeyan Jousters from the previous chapter. Once they're dead a Bounce Pad will appear. Using a Giant ignore it and go to the left where there's a Boulder blocking the path, throw that out of the way and walk over to the chain and begin to pull it in for a Feat of Strength. All there is on the island is a Treasure Chest. Turn around and go use that Bounce Pad you ignored to get to the Octophonic Music Player and finish this first section of the level. Step off the ship again and approach the Bark Demon, this kind of enemy eats Chompies to heal. Luckily there aren't very many Chompies around. Avoid the underground attack it sends out as it'll come up and hit you quite hard if you get in its way. Other than that just attack it without staying too close for too long. Once it's dead the Monster Gate will open and let you pick up the key for the gate. As you approach the Mabu being attacked by Drow Lance Masters they'll get distracted and come after you. As a Giant you could just smash through the wall on the right to get the key but for a normal Skylander you'll need to get a bomb from the building here next to the Bark Demon and Root Runner. Either way you'll want to go inside as, behind a bombable wall, there's the Legendary Treasure "Propeller Pilot House Roof". Take the bomb and head back out to blow up the wall to your right. Grab the key and unlock the door. As you go through the gate you'll be introduced to the first Drow Archer, these imp-like fellas fire from range, you can see their targetting icons on the ground so you know where to move. If you can't hit them back from range you'll have to wait for it to jump down, you get this to happen by killing the other enemies on the ground already. A Giant can cut the fight short by throwing the nearby boulders at the doorways of the keep behind the archer. Otherwise keep killing until the camera angle changes. Cross the bridge towards the next group of Chompies and you'll inadvertantly rescue another Mabu. Go into the first house. There's nothing of real interest in here but you need the location. Turn around and go into the second house. Inside you'll find a key and a Mabu named Bert who wants to play Skystones with you. Unfortunately at this point you don't know how to play Skystones so you'll perhaps want to come back here once you do (it's not actually necessary for completing the 3 Stars). Go outside and the area will be full of enemies again. After killing the Bark Demon you'll be able to use a Bounce Pad to reach the Drow Archers on the ledge. Up top you'll find another couple of Archers and the second key. As a Giant push the large block forward to create a bridge, on the island is a Treasure Chest. Turn around and go back down along the left side, use the higher bounce pad to reach a small floating platform with another bounce pad on which will take you to the Story Scroll. This one's a hint for the previous chapter's hidden Chompy Pit prize. With your two keys go over and unlock the gate to reach Moneybags himself, Auric. Talk to him again to look at his shop. You can't get these hats elsewhere in the game so you might as well buy them if you can afford them. They will still be here if you use Chapter Select later on, the unique items he sells are unique to each shop so the next chapter's shop will have a different assortment of unique hats or other items. Pick up the engine to finish this second section of the level. Forwards off the Dread-Yacht again, if you haven't been to talk to Persephone yet the game will leave the gangplank up until you do, kill the two Bark Demons and the Root Runner to open up the Monster Gate. On the other side is a trio of Drow Archers you'll want to kill as well as a load of Drow Lance Masters. Go off the righthand side to drop down next to a mole called Harvey. Head into the cave if you have an Earth Skylander. An Earth Skylander would find it much easier in here thanks to all the rocks, everyone else will have to use the provided Minig Pick. Clear the rocks to the north first, then go up the ramp on the right there, drop south to where there's a bomb waiting. Even Giants will need bombs to break through the Tzo Crystals, although not Crusher and Prism Break can break them too. First blow up the Crystals to your left then run a bomb directly across to another pair. This path leads to a locked gate, you don't have the key yet. Take another bomb north-west and throw it at the Tzo Crystals in the corner (this one's just coins so not essential). Then grab the bomb and throw it from the bottom of the ledge you first jumped off up towards the Tzo Crystals. As long as you don't hit the candle it should be able to reach (and if you do hit the candle just keep trying, it'll eventually slide far enough away). Go up the ramp and through the smashed crystals to get a key. Now in the top-right corner there is also another Tzo Crystal behind which you'll find a Treasure Chest. To smash that one grab the bomb and quickly run into the ramp room and throw it from the ledge beneath the Crystal. You should just be able to make it. With the key go up the left corridor back at the start and open the Present with a Police Siren Hat inside. Head out of the cave and bounce back up to the main path. Finish off any enemies you left here and then jump into the turret. Not entirely sure what the point of the reticle placing is but point at the circle and then get firing at the three padlocks. Go through the now open gate and, if you have a Fire Skylander, drop down the far side to a cave below. It might look odd but you can use any Skylander on the lava, it doesn't have to be a fire one (you just need a Fire one to open the gate). Shake open the Present to get your Biter Hat. Just a short area, go back out and bounce back up. Bounce up to a row of blocks and you'll meet Persephone again. She'll introduce you to the Winged Sapphires, you'll be picking that one up in a moment. Push the left block forwards three times then get on the other side of it and push it back into line with the other two. Go up the wooden slope to the right, if you have a Giant smash and grab the Soul Gem for Hot Head, "Hot Rod", if you don't have a Giant then there is another fairly tough way to smash it. You need an Earth Skylander and a fast Skylander. Go back to the Under Mines area and grab the bomb, quickly rush outside and throw it south-east, if you're lucky you'll smash the wall. Carry on around to where Persephone was and grab the Winged Sapphire. Cross over the block bridge you made and jump into the turret. Use it to shoot the Windmill to the right of the locks as well as the locks themselves. You'll probably also want to shoot the Drow Archers that appear and perhaps the caravan they appear out of. Go over and pick up the Luck-O-Tron Wheel of Health that was inside the Windmill. If you use this in the Luck-O-Tron you'll get an increased chance of food. Pick up the Compass to finish the third and final section of the level. You're now free to roam this game's hub, after a brief chat with Auric that is. Like earlier Persephone's Cabin is to the left, but there are also a couple of new places open now. Cali is on the deck and will let you take on Heroic Challenges. Next to Cali and directly opposite Persephone's is Cali's Room, inside of which you'll find the Luck-O-Tron, use one of the Wheels you've found to boost Experience or Food. You'll eventually be able to fit four wheels into this thing but for now you can do only one. The other cabin on the deck is Flynn's Cabin, in there you can customise the ship with the Legendary Treasures you've found. Breakstone in there will tell you what to do. If you back out onto the Main Deck go up to where Flynn is standing you can find a Winged Sapphire if you go around the left side of the front of the ship. Perfect in 8. Go through the door that it opens and you'll find Auric in the Game Room. You can buy some things off him. The bulb will let you use two wheels in the Luck-O-Tron, the hats you won't find anywhere in the game (and are in fact platform exclusive hats from Spyro's Adventure), the Key is just a way of skipping a Lock Puzzle if you either find it too difficult to solve or just can't be bothered, it'll remain in your possession until you use it at a Lock Puzzle. The PvP Battle Mode Arena is from the first game and cannot be unlocked by any other means, you only need to unlock this in one save file. And Camo's Heroic Challenge from Spyro's Adventure, he doesn't have a Series 2 toy so you cannot unlock it other than by purchasing from Auric here. All in all Auric's Store is a good way of getting rid of some of that overloaded gold your Series 1 toys may have accumulated. And there's no rush to buy the things, they'll still be here until you choose to buy them. Also in the Game Room is an Elemental Door, if you use a matching attack on it it'll open. Once you get through the various elements that it asks you to you'll find a load of coins to pick up. Once you're done shopping and upgrading talk to Flynn up at the front of the ship to get on with the story. is the best website ever! Okay, okay, I'm done commenting. Sorry I messed up on . The whole list of all the known Skylanders: :ninjini: :crusher: :thumpback: :hotdog: :bouncer: :eyebrawl: :swarm: :treerex: and I can't do the swap force. is creepy. And I don't mean the website. I mean the DRAGON. The dark version of . But :flynn: is awesome I think. are in the first console starter pack. Never mind I found out. You do this, right? I want to show faces. How do you show Skylander faces in your comments?